Jimmy Butler is averaging 18.7 points per game with the Sixers. Jimmy Butler will face his former team for the first time on Tuesday, as the Minnesota Timberwolves visit the Philadelphia 76ers. This reunion isn't about the crowd reaction. The Philly crowd will certainly be happy to welcome back Robert Covington (who is out with a right knee bone bruise) and Dario Saric, two starters from the team that made a surprise run to the Eastern Conference semifinals last season. Butler won't make his return to the Target Center until late March, and we'll see then how Minnesota fans feel about him in the aftermath of his departure. Tonight, all eyes will be on Butler and his former teammates, the ones he chose to leave behind when he asked to be traded last summer. What should the Wolves and Sixers expect in their looming showdown? It took almost eight weeks of distracting drama in Minnesota -- an off-site meeting with then team president Tom Thibodeau, a no-show in training camp, boorish behavior in a scrimmage, missed games for "general soreness," and a disappointing, 4-9 start -- before the Wolves finally traded Butler, along with Justin Patton, to Philadelphia in exchange for Covington, Saric, Jerryd Bayless and a second-round pick. Nine weeks later, both teams seem to be in a better place. In regard to how well they've played since, the trade has worked for both the Sixers and Wolves. They had a combined record of 12-15 at the time of the deal and are a combined 37-23 since. Both still have room to grow over the final 12 weeks of the season. The Sixers want to reach The Finals, and with Butler able to opt out of his contract this summer, they have urgency -- even though Joel Embiid and Ben Simmons are just 24 and 22 years old, respectively. The Wolves, meanwhile, are still very much in the race for a playoff spot in the deep Western Conference, sitting just one game in the loss column behind the eighth-place Jazz. Does Butler fit in Philly? Philadelphia has had a series of fits and starts since Jimmy Butler came aboard. The early days of Butler's time in Philadelphia will be remembered for his late-game heroics. Butler hit two (almost identical) game-winning 3-pointers -- one in Charlotte and another in Brooklyn -- in his first seven games with the Sixers. After losing their first game with their new star (blowing a 16-point, fourth-quarter lead in Orlando on Nov. 14), the Sixers won 10 of their next 12. That was against a relatively soft (and home-heavy) stretch of schedule, though. And seven of the 10 wins were within five points in the last five minutes. Butler made an immediate impact by helping his new team win those close games, shooting 5-for-10 with the score within five in the last five over that 10-2 stretch, with the two game-winners being the highlights. Take a look back at the path that led to Jimmy Butler being traded to Philly. Butler suffered a groin injury at the end of that stretch and missed the next two games (both losses at home). The Sixers lost five of their last nine games in December, including their Christmas game in Boston, when some late-game offensive struggles -- the Sixers shot 3-for-17 with the score within five points in the last five minutes of the fourth quarter or overtime -- brought questions of offensive fit to the forefront. Embiid hasn't been happy about having to spend so much time on the perimeter, with Simmons occupying the paint when he doesn't have the ball. Butler has reportedly voiced concern about his role in the offense as well. 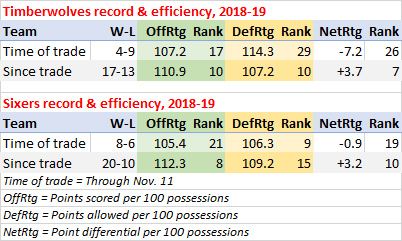 The Sixers rank eighth in offensive efficiency since the trade, but they've played a lot more games against bottom-10 defenses (14) than they have against top-10 defenses (eight) over that stretch. 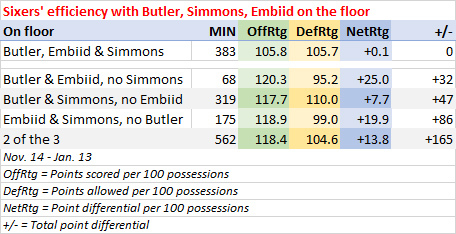 And in 383 minutes with all three of Simmons, Butler and Embiid on the floor, the Sixers have scored just 105.8 points per 100 possessions, a mark well below the league average (108.7). They've been much better offensively (scoring more than 118 points per 100 possessions) in 562 minutes with just two of the three stars on the floor. There's still a lot to figure out in Philadelphia, and the upcoming schedule will challenge the Sixers to do just that. The Wolves will be both the best team Philly has faced in the last two weeks and the worst team it will face over the next four. Beginning with their visit to Indiana on Thursday, the Sixers will play 12 straight games (and 16 of their next 18) against teams that currently have winning records. They're just 7-8 against that group thus far. Minnesota has pumped up its defense since trading away Jimmy Butler. While the Sixers improved offensively since the trade, the Wolves have taken a step forward on the other end of the floor. In fact, in each of their first nine games after the trade (including one before Covington and Saric suited up), they allowed less than 109 points per 100 possessions, something they had done just once in their 13 games before the trade. The Wolves won nine of their first 12 games after the trade and ranked third defensively over that stretch (having ranked 29th on defense prior to the deal). But, as was the case with the Sixers' early post-trade success, the Wolves benefited from a friendly stretch of schedule. Ten of those 12 games were at home and seven were against teams that currently have losing records. The Wolves then went 4-9 in a stretch where they played 10 of 13 games on the road. And at the end of that stretch, they lost Covington to the knee injury that will have him missing a seventh straight game tonight. They returned home to beat the Magic and Los Angeles Lakers, but that wasn't enough for Thibodeau to keep his job. He was fired on Jan. 6, with the Wolves in 11th place at 19-21. Which East and West teams are primed to make a late-season playoff push? New coach Ryan Saunders has led the team to two wins in his first three games. The Wolves are one of just three teams that ranks in the top 10 on both ends of the floor since the trade. But they're just 17-13 (fifth-best mark in the Western Conference) over that stretch, in part because they're 7-8 in games that were within five points in the last five minutes (perhaps missing Butler's ability to get late-game buckets). Through the various stages of their season, the Wolves' offense has improved steadily. In 30 post-trade games, Karl-Anthony Towns has averaged 23.5 points on 51 percent shooting, up from 19.9 on 46 percent prior to the trade. But the Minnesota defense has had its ups and downs. If they get stops, they win. The Wolves are 14-0 when they've allowed 104 or fewer points per 100 possessions and 7-22 when they've allowed more than 104. The opportunity is there to get back to the playoffs and prove to Butler that they didn't ****ing need him. But the Wolves have one of the league's toughest remaining schedules, with 24 of their final 39 games against teams that are currently over .500. The Sixers are one of those over-.500 opponents and, for both teams, tonight's game in more than a reunion.